The Magnes Collection of Jewish Art and Life at the University of California, Berkeley’s Bancroft Library, the latest addition to the city’s burgeoning downtown arts and culture district, is opening to the public on Sunday, Jan. 22. The grand opening, which runs from noon to 4 p.m. and is free, will take place at the collection’s new, 25,000-square-foot facility at 2121 Allston Way, near campus and Downtown Berkeley BART. The celebration will feature music, food and exhibitions of contemporary artists’ projects and highlights from The Magnes’s permanent collection of precious art, rare books and objects that represent the culture of Jews in the global diaspora and the American West. The new Magnes offers unprecedented on-site access to most of the nearly 15,000-item collection in its new conference and research rooms, auditorium and galleries. In addition, The Magnes’s Western Jewish Americana archives, the world’s largest collection of letters, diaries, photographs and documents relating to the Jewish settlement of the West, are now available at UC Berkeley at The Bancroft Library’s Heller Reading Room. The Allston Way building is a former printing plant that was updated for The Magnes by Peter Pfau (Pfau Long Architecture, San Francisco) and Oblio Jenkins (Pacassa Studios, Oakland) with a blend of vintage and modern design. The interior glass walls and inventive open storage display provide an intimate and powerful connection to objects from around the world. The new facility emerged from a groundbreaking partnership between one of the first Jewish museums in the country — the former Judah L. Magnes Museum in Berkeley, The Bancroft and several generous donors. Staff and supporters said the partnership gives critically needed new life to the collections, while enhancing Bancroft’s research holdings, elevating Jewish scholarship on campus, making The Magnes’s collections more accessible to scholars and the community and providing a new gathering place for cultural and academic events. Alla Efimova, who is the Jacques and Esther Reutlinger Director of The Magnes, said the opening marks the transition to a radically new model for identity-based museums and collections. “The Magnes Collection of Jewish Art and Life is the most varied and comprehensive documentation of a single California community to have joined to the Bancroft family of collections since Hubert Howe Bancroft first assembled his remarkable collection on California and the American West in the 19th century,” said Elaine Tennant, Bancroft director. “In the same way that the original Bancroft Collection aimed from the outset at recording the full experience of California and the West in wide-ranging formats and genres, the Magnes Collection is the rich record of Jews in the West and in the global diaspora as told through objects, documents, and images of all kinds,” said Tennant. Greeting visitors to The Magnes is a colorful tile mosaic proclaiming: “In remembrance is the secret of redemption.” The mosaic is a fragment of a Holocaust memorial built over a 15-year period by children at the former Camp Swig Jewish summer camp in Saratoga, California. Regional Jewish history, a special component of The Magnes, is evident in the facility’s portrait-lined wall, which includes such Bay Area Jewish leaders as financier and philanthropist Isaac Glazier (1829-1906); Florence Prag Kahn (1866-1948), the first Jewish woman to serve in the U.S. Congress; and Boris Deutsch (1892-1978), a Lithuanian-born painter and set designer for Hollywood films. “Dissolving Localities: Berkeley Jerusalem,” an evolving multimedia project by composer and artist Emmanuel Witzthum, a resident fellow at UC Berkeley’s Townsend Center for the Humanities and a visiting artist in the Department of Music. “The Magnes Effect: Five Decades of Collecting” in the Charles Michael Gallery. 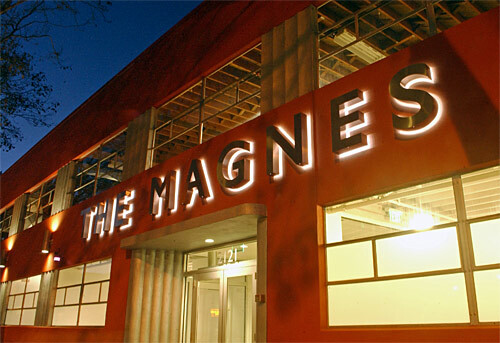 It traces The Magnes’s 50-year legacy with art, artifacts and rare books. “Case Study No. 1: Shaken, Not Stirred” in the Warren Hellman Gallery. This exhibit highlights art and artifacts rediscovered by Magnes staff during the move to the new facility, including an 18thcentury Shofar, a horn used for religious purposes, a 19thcentury wedding dress from Rhodes, Turkey, and a bronze statuette by 20th century sculptor Chana Orloff. “The Spill,” a digital film created for The Magnes launch by Berkeley artist Gale Antokal. It will be projected on the wall of the Koret Foundation/Tad Taube Lobby. Throughout the year, educational and public programs at The Magnes will include tours, lectures, artist talks and scholarly symposia, as well as collaborations with local cultural and performing arts institutions. • “Bancroftiana” reports on the Bancroft-Magnes merger. • Information for Magnes visitors is online. • The Magnes hosts a rich array of digital resources.